ACS has Lawyer Chapters in nearly 50 cities and active organizing efforts in a number of other locations. A list of all ACS Lawyer Chapters is available here. If you are interested in helping to organize a Lawyer Chapter, please contact us at LCEmails@acslaw.org or 202-393-6181. Access our member job bank here. Not yet an ACS member? Join our network today, or click here to have your membership auto-renew each year. The ACS Constitution in the Classroom program provides an opportunity for lawyers and law students to teach lessons based on the U.S. Constitution in elementary, middle, and high schools throughout the country. Interested in participating on Law Day (May 1)? Check out the curricula here or email LCEmails@acslaw.org with “Constitution in the Classroom” in the subject line. Join us for the premier progressive legal gathering of the year! The 2019 ACS National Convention will bring together lawyers, law students, judges, and policymakers to address some of the most urgent and challenging issues confronting our nation. Click here to register – early bird prices will end on May 1. Click here to access the Public Interest Fellowship application, due April 30. CLE Credits are a great way to attract new members to an ACS Lawyer Chapter event as well as encourage and incentivize programming attendance for busy ACS lawyers. More on how to apply for CLE here. 2016 Program Guide: Are All Voters Created Equal? 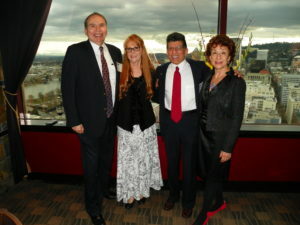 On March 13, 2019, the ACS Oregon Lawyer Chapter held its Annual Dinner honoring three progressive champions on the West Coast. A lively networking reception gave way to dinner and a welcome from both the Chapter and ACS National to kick off the evening’s events. The night’s keynote speaker, Oregon Supreme Court Chief Justice Martha L. Walters, roused the audience with a poignant reflection on the need for state court funding. The 2019 Hans A. Linde Award went to the Honorable Rocky Barilla, former Representative in the Oregon Legislative Assembly, whose long career defending the rights of immigrants includes his pioneering of Oregon’s 1987 Sanctuary Law. 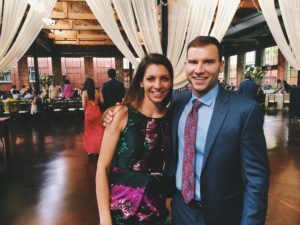 The Chapter also awarded ACLU Staff Attorney Leland Baxter-Neal and Stoll Berne Attorney Nadia Dahab its inaugural Rising Star award for their efforts in the immigrant rights space. The evening proved to be a moving testament to the past and ongoing work done by attorneys and judges around the state to make Oregon a welcome place for immigrants and a national leader in the fight for their fair legal treatment. We are grateful to Portland City Grill for hosting another memorable Annual Dinner, and owe a huge thank you to Chapter Chair Bradley Krupicka and Board Members Erin Roycroft and Shelby Smith for all their hard work in planning a wonderful event. View past Lawyers of ACS events here. “As ACS members and chapter leaders, we are immersed in the debate about the role of the judiciary, and we are committed to providing a platform for the progressive voices in Tampa to share their views and ideas. Over the past few years, for example, we have organized talks on Justice Brett Kavanaugh’s nomination, Florida’s Federal Judicial Nominating Commission, the Florida Supreme Court, and the role of State Attorneys General. Read more from Julie, Kevin, and previous Lawyers of ACS here. ACS is launch an At-Large Chapter in 2019 with the goals of providing a forum for progressive lawyers in rural and suburban areas that want to make an impact in their local communities and beyond; and serving as an incubator for progressive lawyers in areas where there is no existing infrastructure for a lawyer chapter to establish a stand-alone, sustainable lawyer chapter. Learn more about the At-Large Chapter here. Get an email sent to my list? ​Request event funding? Get help with programming and/or speaker ideas? ​Get involved with pro bono or volunteer opportunities? ​Seek media advice or guidance? All of our Lawyer Chapters are listed here.